Edward B. 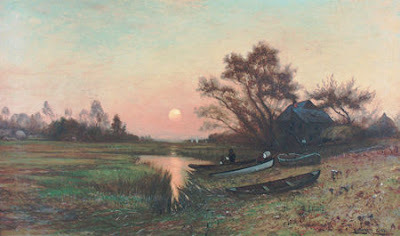 Gay, American (1837-1928) "Fisherman's House"
This morning, on my 42nd first day of school as a teacher (!! ), I rode my bike to school through a magical early morning twilight, starting out from my apartment a little before sunrise. The light on the homes and trees and fields was soft and silvery, and, just when I was passing an old gray barn with antique cars sitting inside, I saw the orange glow of the sun just beyond the eastern trees. The ride was inspiring, to say the least – a perfect way to start a day that is always one of my happiest of the year. However, I was not at my best as a teacher. Mainly, I was not a thorough teacher. I think we had a little fun in the classes, the kids smiled now and then, and, for the very first class of the year, it wasn't a failure, but I wasn't thorough. I covered six items superficially, whereas I probably should have covered just one or two with care and attentiveness. I was a happy, friendly teacher, but not an especially meticulous one. Also, looking back, I see, as often happens with me, that I was not attentive to individual students. I was attentive to the classes as a whole, but somehow I forgot to look enough at individual students, to really see them for a few seconds as I was teaching. How good it is for a student to feel that a teacher really noticed her or him -- and I did rather little of that today.